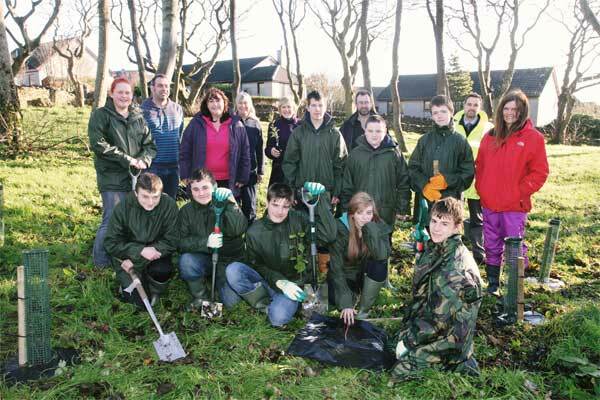 The long term health of the Papdale Woods is being boosted with help from Pupils of Kirkwall Grammar Sschool. Assisted by the Orkney Woodlands Project, a group of S3 pupils will be planting around 50 young trees including sycamore, beech, oak, elm, holly and hazel. This will extend the lifespan of the wood and increase its diversity. The new trees and species will gradually become established to replace existing mature trees when they finally come to end of their natural lifespan. Ronnie Bruce, Project Director for Morrison Construction said: “We are delighted to support today’s planting initiative organised by Orkney Woodland Project who carry out a lot of good work in the local community to conserve and enhance our landscape. “The range of species of young trees and shrubs being planted will add to the overall diversity within the Papdale Woods.